Both the BJP and DMK members had opposed the nominations of Tamilisai Soundararajan and Kanimozhi in their respective parties for the Tuticorin constituency. 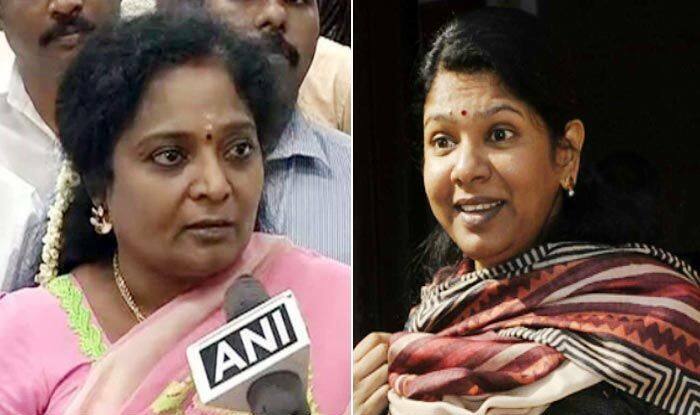 Tuticorin: The nominations of BJP candidate Tamilisai Soundararajan and the DMK candidate Kanimozhi were accepted to contest from Tuticorin parliamentary constituency, stated a report. Earlier, there was a delay in the acceptance of the two high profile nominations as both the parties were opposing each other. Notably, the scrutiny of the nominations for the Lok Sabha elections 2019 began on Wednesday. Soon after the scrutiny process in Tuticorin was over, Director Gowthaman stated that the DMK members had allegedly opposed the nomination of Tamilisai Soundararajan since she failed to mention the fact that she is the director of Bharat Petroleum Corporation Limited (BPCL). He added that the BJP members have opposed the nomination of Kanimozhi for not mentioning her PAN number in the nomination papers. Addressing the media, District Collector and District Election Officer Sandeep Nanduri said that out of the total 62 nominations filed, 51 nominations were accepted, ten were rejected and one nomination was adjourned as it was objected and is granted time till Thursday. After the scrutiny process, the nominations of both the BJP and DMK candidates were accepted as the details in their forms were proved to be correct. The DMK will contest in 20 Lok Sabha seats in Tamil Nadu and the remaining 20 (19 in Tamil Nadu and the lone Puducherry seat) have been allotted to its various electoral allies, including the Congress, the Communist Party of India-Marxist and the MDMK. The party has also named D M Kathir Anand, son of party leader Duraimurugan, from Vellore and Kalanidhi Veerasamy, son of senior leader Arcot N Veerasamy, from Chennai North.